Research Scholar, Karpagam University 1, Coimbatore and Asst. Professor, Dept. of Pharmacology 2, Sinhgad Technical Education Society’s, Smt. Kashibai Navale College of Pharmacy, Kondhwa, (Bk) Pune-411048. INTRODUCTION:Diabetes mellitus (DM) is a chronic illness that affects health related quality of life (QOL) of patients 1. It is the illness which requires regular patient self-management education and continuous and medical care. Type 2 DM had showed significant impact on physical and psychological wellbeing of patients. Self-perceived QOL related to diabetes is an important outcome for diabetes education programs2. Psychological well-being appears to be an important goal of diabetes management and it should be taken into consideration in everyday diabetes care. Multiple factors such as glycemic control, types of treatment, numbers and types of complications and comorbid conditions, and demographic variables are studied to evaluate the association between health related quality of life (HRQOL) and these factors 3. Qualitative and quantitative changes in the patient’s relationships are seen in DM 4. Good glycemic control could delay the onset and progress of complications5, 7. Social support 8, 11 problem-focused coping 12 and self-efficacy 8, 12-16 relate to good regimen adherence and glycemic control. Taking into consideration the changes in relationship many instruments are designed to assess the QOL of patients where due importance is also given to assess physical, psychological and social functioning 17. The instrument was originally developed and validated by Dr. Arie Nouwen in French language and had also been translated in English and German language to assess diabetes-related psychosocial issues. The instrument consists of three dimensions of MDQ: Section I general perceptions of diabetes and related social support measuring interference, severity and social support. Section II, social incentives related to self-care activities measuring positive reinforcing behaviors and misguided reinforcing behaviors. Section III, self-efficacy and outcome expectancies measuring self-efficacy and outcome expectancies. MATERIALS AND METHODS: The study was conducted in two hundred fifty outpatient clinics in Pune. Patient information leaflet was given to the individual patients and the written consent was obtained. The MDQ questionnaire was administered to diabetic patients twice during total study period. For translation procedure, one of the authors acted as the local project manager who carries out the cognitive debriefing interviews. He was a native speaker of the Hindi language and a resident of India. The study was designed as shown in fig. 1. Following two step were carried out to translate the original MDQ into Hindi language and produce a version that would be conceptually as close as possible to the original questionnaire. Step I:Forward translations: The English questionnaire was given to two translators. Translator I was an occupational language translator with Hindi as native language and had very good command over English. The translator II was a diabetologist who also was a native Hindi speaker and had extremely good command over English. Back translation: The intermediate MDQ was given to the two translators who had never seen the original MDQ before. Information was given regarding the questionnaire explaining that it was a health related quality of life assessment tool specific for diabetes type 2. They were requested to formulate the questions in simple English language understandable to everyone.Translator I was an official translator having vast experience in language translation and translator II was a dialectologist who also was a native Hindi speaker. Both of them had extremely good command over English as well as Hindi language. Second intermediate Hindi questionnaire: The above two separate back translations were then compared to each other and also the original questionnaire. All questions by both the translators were similar (explaining same meaning) to each other and to original questionnaire. Pilot testing: The final second intermediate MDQ was then administered to 50 patients with type 2 diabetes. These patients had never seen the MDQ questionnaire before and were all native Hindi speakers. Patient population comprised of males 42and females 8. All patients with history of diabetes were asked to fill MDQ questionnaire and were then interviewed for difficulty in understanding the questions and their meaning. They were also asked for the questions that confuse, divert and upset them during the filling of questionnaire. Validation Study (Study population and sample size): Patients who participated in the validation study were Hindi speaking adults above the age of 18 years with a clinical diagnosis of diabetes mellitus type 2 at the time of the first study visit. A total of 250 diabetic patients (31 females and male 219) were scheduled to participate in the study. A consent form and Hindi version of MDQ was given to patients and they were asked to fill the same. After the interval of 4 weeks the same study population was asked to fill the questionnaire. Patients were on the regular treatment between visits. Validation Study (Measurement of outcome): The MDQ in diabetic patients was measured by using 41 item scales. The instrument consists of three dimensions of MDQ: Section I general perceptions of diabetes and related social support measuring interference, severity and social support (16 items) measured on a 6-point response scale from “Not at all” to “Extremely”. Section II social incentives related to self-care activities measuring positive reinforcing behaviors and misguided reinforcing behaviors (12 items) measured on a 6-point response scale from “ Never” to “Very often” and Section III self-efficacy and outcome expectancies measuring self-efficacy and outcome expectancies (13 items) measured on a 100 point response scale from “Not at all important” to “Very important”. Statistical analysis:Internal consistency and reliability of dimensions of the questionnaire were assessed using Cronbach alpha coefficient. Alpha values equal to or greater than 0.70 were considered satisfactory. Test re-test i.e. reproducibility was assessed across a 4-week interval on 250 patients using interclass correlation coefficient. Kruskal-Wallis H test results for multiple group comparison and Mann-Whitney test results for pairwise comparison was used. Pearsons correlation coefficient was calculated for each of the three sections and seven subs-domains. All statistical analyses were performed with the SAS software package (version 9.1 for Windows). Significance was set to 0.05 for all analysis. RESULTS: Demographic and clinical data of the respondents indicates that out of two hundred eighty six people with diabetes type 2 that participated in the study, two hundred fifty (87.41 %) participants completed and returned the questionnaires. The study design is presented in Figure 1. Mean age was 58.0 (SD = 6.7) years (range=18-75). Other demographic characteristics of the patients are presented in Table 1. Out of 250 patients 219 respondents were male and 31 were females. As per the demographic study 50.8 % of patients were without any diabetic complications while 49.2 % of patients were suffering from diabetes related complications. Out of 250 patients 16.8 % were found to be overweight and 3.2 % were obese. Average age of diagnosis with diabetes was 6.98 years (SD=1.73). The mean, standard deviations and reliability coefficients of the seven domains are presented in Table 2. Results indicate adequate internal consistency ranging from 0.71 to 0.91.Internal consistency was assessed using Cronbach’s alpha and value of 0.84 was gained for the summary score (Section I, Section II and Section III), indicating high levels of internal reliability. Alpha values for total ranged from 0.84 (maximum) to 0.82 (minimum). Alpha values for all the three sections, general perceptions of diabetes and related social support was 0.81, social incentives related to self-care activities was 0.93 and for self-efficacy and outcome expectancies it was 0.87 as shown in Table 3. Pearson correlation was assessed for all the three sections and the correlation was found to be significant for all (p< 0.05) as presented in Table 4.A higher correlation between all the three sections was observed. Table 5 presents the correlations among the seven domains of MDQ. Statistically significant correlation (p<0.01) was observed between interference and positive reinforcing behavior, misguided reinforcing behavior, self-efficacy and outcome expectancies. Also significant correlation was found between severity and outcome expectancies. Misguided reinforcing behavior showed weak positive correlation with self-efficacy. Positive reinforcing behavior showed strong positive correlation with misguided reinforcing behavior and weak association with self-efficacy. I, Interference; S, Severity; SS, Social Support; PRB, Positive Reinforcing Behavior; MRB, Misguided Reinforcing Behavior; SE, Self Efficacy; OE, Outcome Expectancies. **p<0.01 for all values shown as Pearson’s correlation coefficients. DISCUSSION: MDQ was developed to facilitate data integration and was not designed to provide a comprehensive assessment. It is comprised of self-report measures that can be used along with other assessment procedures including medical, behavioral, or any other relevant psychosocial measures.MDQ is comprised of three sections focusing on general perceptions of diabetes and related social support, social incentives, self-efficacy, and outcome expectancies in relation to self-care activities. 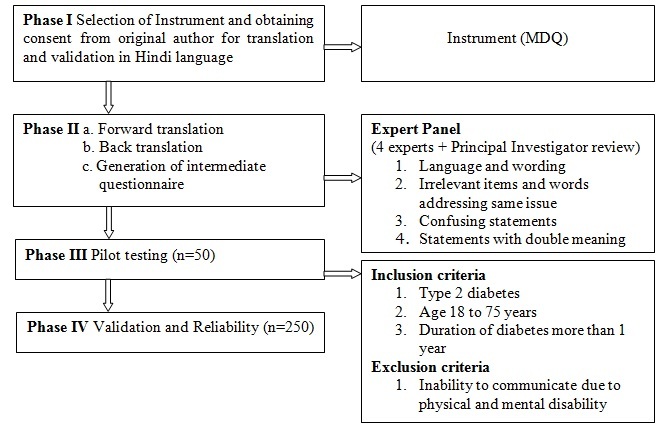 The present study assessed the validity and relaibility of the Hindi version of MDQ in 250 patients with type 2 diabetes. This validation was performed in four phases I to IV. MDQ questionnaire was subjected to pilot study (n=50) after forward and backward translation. The internal consistancy of questionnaire for the summary score was high with cronbach’s alpha coefficient (0.84). The internal consistancy of three subscales were also satisfactory (>0.7) and adequate internal consistancy for all seven domains were observed from (0.71 to 0.91) whereas the study of Arie Nouwen et al showed the internal consistancy ranging from (0.70 to 0.91). The interclass correlation coefficients also indicate good reproducibility of questionnaire which supports the study of Arie Nouwen et al. CONCLUSIONS: In conclusion, the results of this study indicate that the Indianversion of the MDQ was reliable. Thus the translated instrument helps to study the psychological performance of diabetic patients towards diabetes. 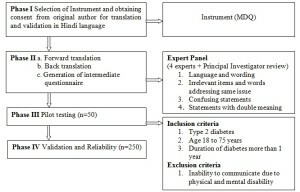 The present study demonstrated that the Hindi MDQ is useful for assessing quality of life of type 2 diabetes patient’s in clinical settings. The study carried out indicates that this validated Hindi version of MDQ in Indian type 2 diabetec patients can be further incorporated for utility study. 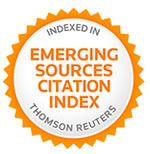 ACKNOWLEDGEMENT: Authors are thankful to Dr. Arie Nouwen University of Birmingham, Edgbaston, Birmingham, B15 2TT, UK for giving permission to use the instrument. 1. American Diabetes Association. Standards of medical care in diabetes--2012. Diabetes Care. Jan 2012; 35 Suppl 1:S11-63. 2. 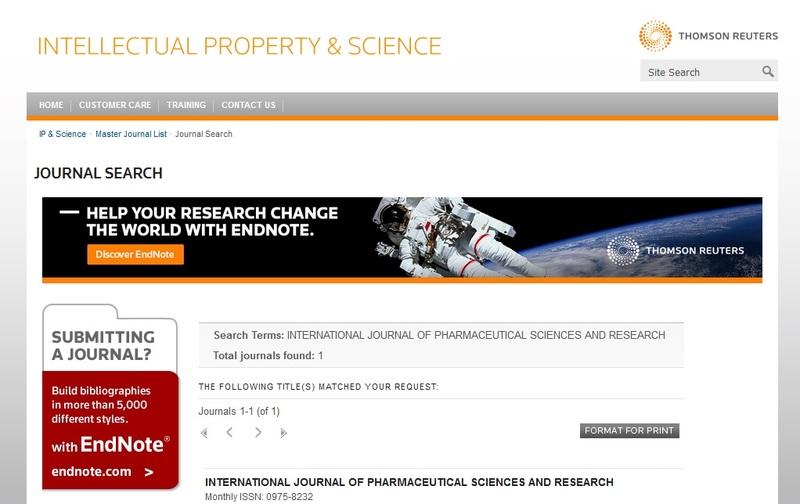 Khader YS, Bataineh S, Batayha W. The Arabic version of Diabetes-39: psychometric properties and validation. Chronic Illn. Dec 2008; 4(4): 257-263. 3. Luscombe FA. Health-related quality of life measurement in type 2 diabetes. Value Health. Nov-Dec 2000; 3 Suppl 1:15-28. 4. Van der Does FE, De Neeling JN, Snoek FJ, et al. Symptoms and well-being in relation to glycemic control in type II diabetes. Diabetes Care. Mar 1996; 19(3): 204-210. 5. The Diabetes Control and Complications Trial Research Group (DCCT). The effect of intensive treatment of diabetes on the development and progression of long-term complications in insulin-dependent diabetes mellitus. N. Engl. J. Med.Sep 30 1993; 329(14): 977-986. 6. The UK Prospective Diabetes Study (UKPDS) Group. Intensive blood-glucose control with sulphonylureas or insulin compared with conventional treatment and risk of complications in patients with type 2 diabetes (UKPDS 33). UK Prospective Diabetes Study (UKPDS) Group. Lancet. Sep 12 1998; 352(9131): 837-853. 7. Ohkubo Y, Kishikawa H, Araki E, et al. Intensive insulin therapy prevents the progression of diabetic microvascular complications in Japanese patients with non-insulin-dependent diabetes mellitus: a randomized prospective 6-year study. Diabetes Res. Clin. Pract.May 1995; 28(2): 103-117. 8. Glasgow RE, Toobert DJ, Riddle M, Donnelly J, Mitchell DL, Calder D. Diabetes-specific social learning variables and self-care behaviors among persons with type II diabetes. Health Psychol.1989; 8(3): 285-303. 9. Garay-Sevilla ME, Nava LE, Malacara JM, et al. Adherence to treatment and social support in patients with non-insulin dependent diabetes mellitus. J. Diabetes Complications. Apr-Jun 1995; 9(2): 81-86. 10. Tillotson LM, Smith MS. Locus of control, social support, and adherence to the diabetes regimen. Diabetes Educ.Mar-Apr 1996; 22(2): 133-139. 11. Fukunishi I, Horikawa N, Yamazaki T, Shirasaka K, Kanno K, Akimoto M. Perception and utilization of social support in diabetic control. Diabetes Res. Clin. Pract.Sep 1998; 41(3): 207-211. 12. Toobert DJ, Glasgow RE. Problem solving and diabetes self-care. J. Behav. Med.Feb 1991; 14(1): 71-86. 13. Lynch CP, Egede LE. Optimizing diabetes self-care in low literacy and minority populations--problem-solving, empowerment, peer support and technology-based approaches. J. Gen. Intern. Med.Sep 2011; 26(9): 953-955. 14. Kavanagh DJ, Gooley S, Wilson PH. Prediction of adherence and control in diabetes. J. Behav. Med.Oct 1993; 16(5): 509-522. 15. Skelly AH, Marshall JR, Haughey BP, Davis PJ, Dunford RG. Self-efficacy and confidence in outcomes as determinants of self-care practices in inner-city, African-American women with non-insulin-dependent diabetes. The Diabetes Educator. 1995; 21(1): 38-46. 16. Talbot F, Nouwen A, Gingras J, Gosselin M, Audet J. The assessment of diabetes-related cognitive and social factors: the Multidimensional Diabetes Questionnaire. J. Behav. Med.1997; 20(3): 291-312. 17. Jacobson AM, De Groot M, Samson JA. The evaluation of two measures of quality of life in patients with type I and type II diabetes. Diabetes Care. 1994; 17(4): 267-274.